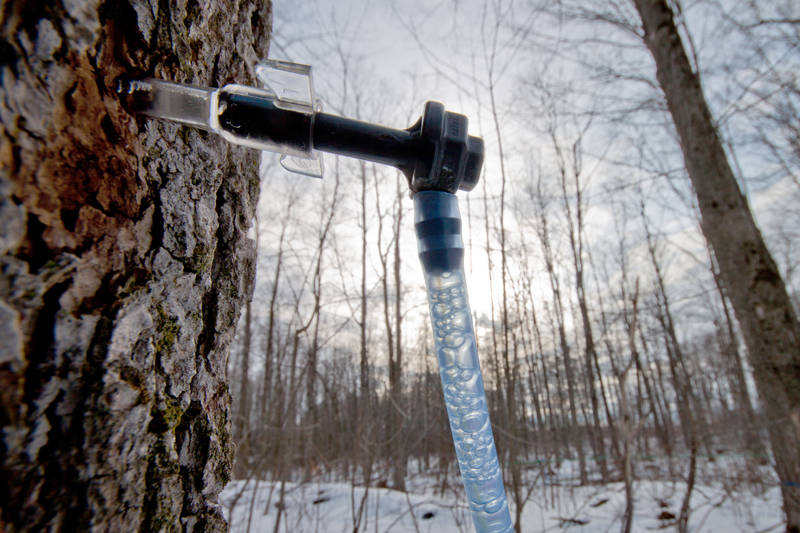 Follow along as we follow the journey of a drop of sap. It starts anywhere from mid February to the middle of April. 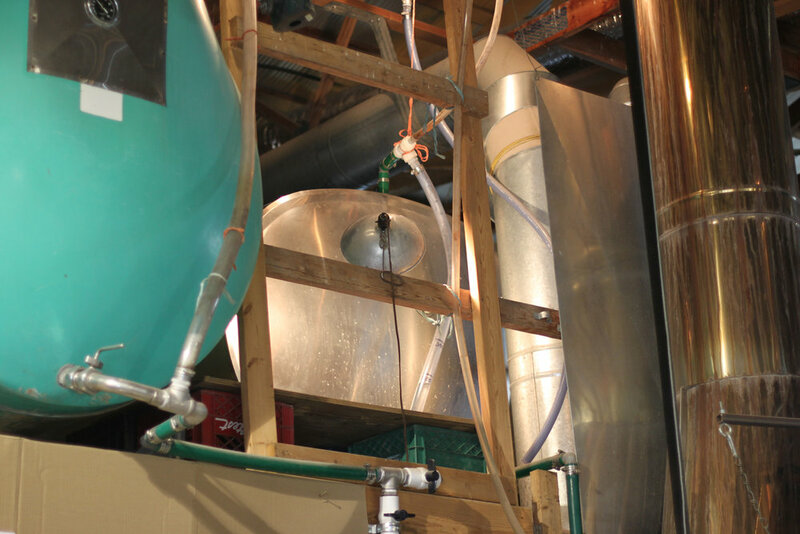 There are many different steps a drop of sap must go through before it can be enjoyed by us all! Exciting News! There's a party at hoover's sap shack! It starts anywhere from mid February to the middle of April. 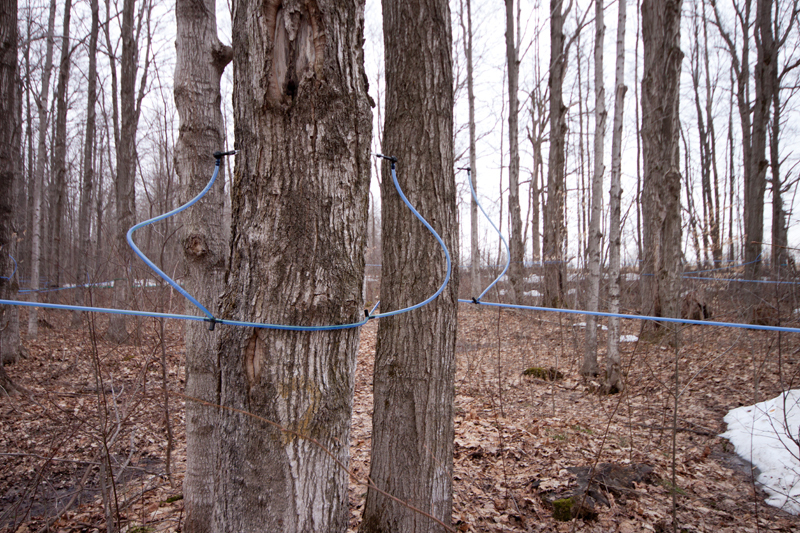 Mother Nature orchestrates the party dates for us drops of sap! Follow along as this drop of sap takes you on it's journey. Before I can start my journey, Mr. Hoover has to ‘tap’ or put a very small hole in the tree and then insert a spile. When it is nice and sunny during the day, with temperatures above 0 degrees, me and my friends start our journey. It is quite a trip! Very exciting, all the things we see and do as we make our way along. Here’s me and my buddies leaving the tree – I am the handsome one, 3rd one in the drop line. From here, we effortlessly float into the lateral line. The lateral lines run from tree to tree so we pick up even more friends along the way. I warned you, it is quite a party! 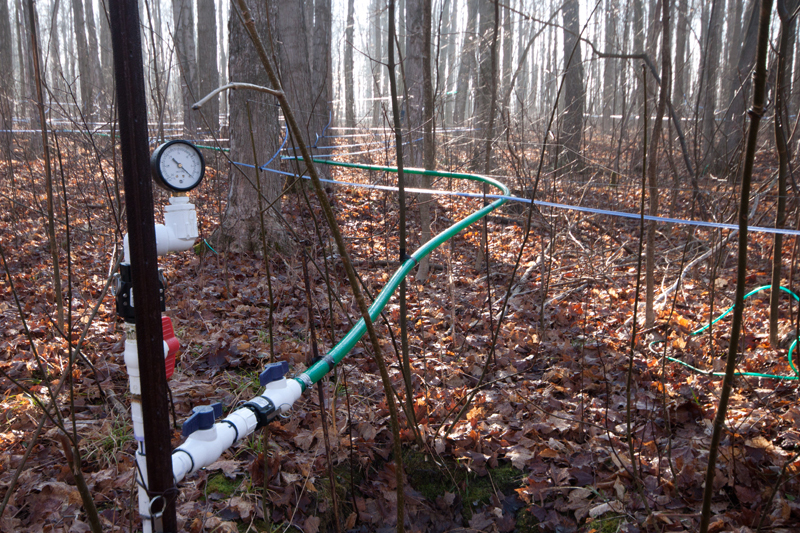 We leave the lateral lines (blue) so that more sap drops can join the journey and we head into the mainline (green). We move at break neck speed so you wouldn't be able to pick me out unless you have a trained eye. 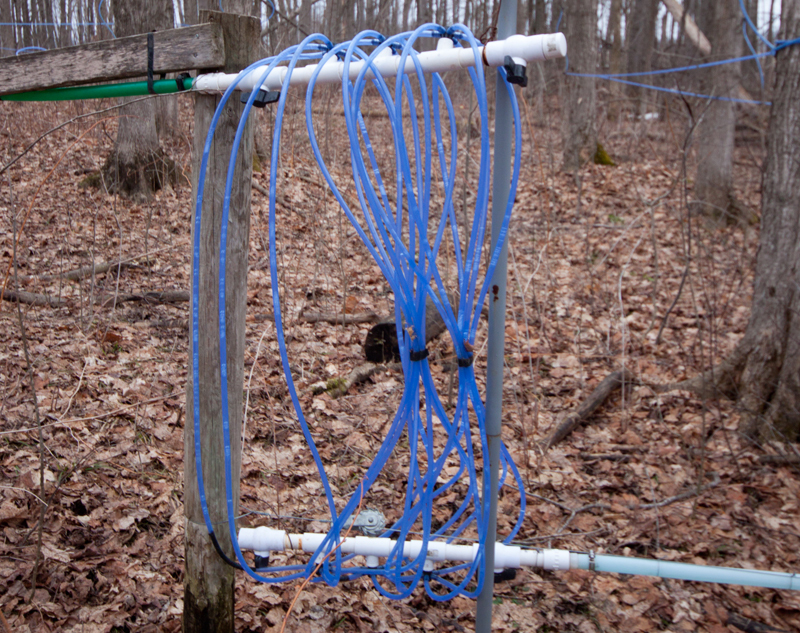 Once we get into the mainline, some of the guys at the front of the bush have to go uphill, so Mr. Hoover has built us a sap ladder so that we can run up hill. Lucky saps, we get to go through that neat sap ladder. The guys at the back of the bush, go through this really neat extractor, which dumps them into a shiny stainless steel holding tank. From there, they go up a reverse slope, kind of like going up a slide backwards, which takes them out to the front of the bush into the vacuum booster. Here we are in the Vacuum booster. We all join back up together at one of the ‘stand pipes’. You’ll notice the round vacuum gauge which tells Mr. Hoover if there is a leak in the system. If there is a leak not all my buddies will be making the journey until it is fixed. This is where we all hold our breath and head underground for a 1500 foot journey to a place they call the extractor room. Here’s me and my buddies, coming through the wall, where we drop into the extractor. The extractor room is 9’ underground. Look at us coming in the small manifold in the top left. Weeeee. What a rush! You don't get this kind of thrill at a theme park! When enough of us get in the extractor, enough of us to raise the float, a pump ‘shoots’ us up to one of the holding tanks. This will give you an idea of what a holding tank looks like. Mr. Hoover has 4 in this picture. While we are in the holding tank, we can rest, but not for long! When these 4 are full, some of us head to an even bigger tank. This tank holds 8,000 litres. That is a whole bunch of us little guys! We kibbitz a bit, sharing stories of our travels this far, before we head to the next machine, which takes out some of the water we are made of, leaving a high concentration of sugary liquid. 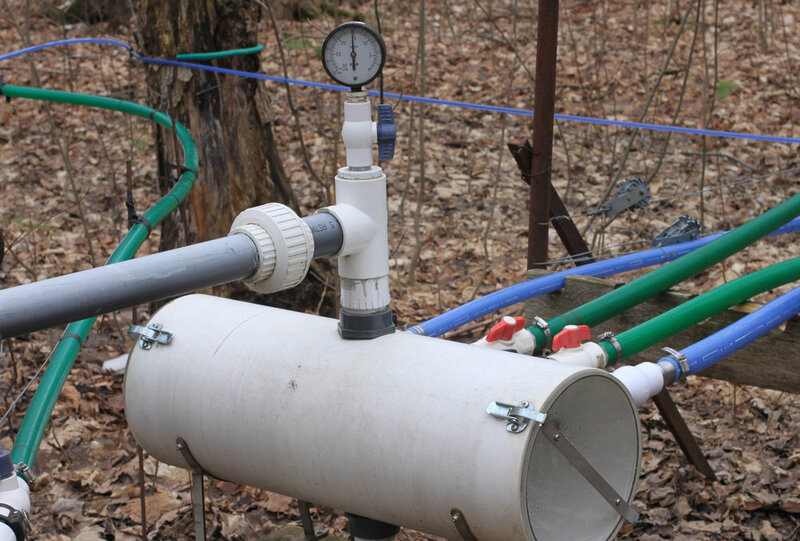 Our next trip takes us into Reverse Osmosis (RO) room. This is the RO machine. 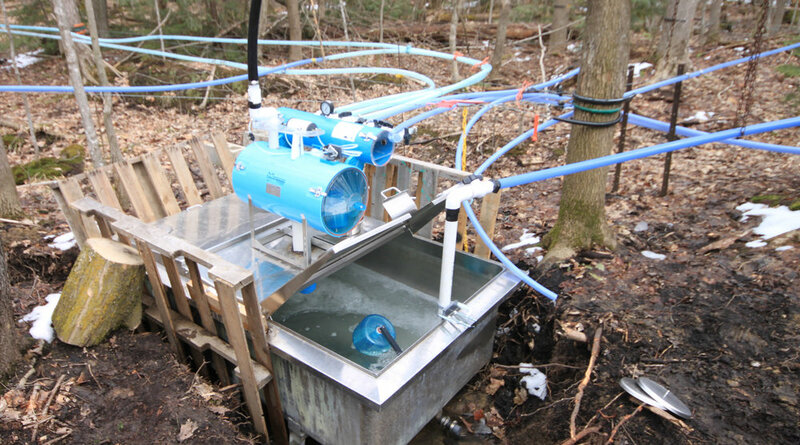 We go through the blue cartridge filter on the bottom to remove any impurities. When we go through the machine, it removes half of the water. So, when we started our journey, we were 2% sugar and when we are finished in the RO, we are 10% sugar. So you might say, it sweetens us up! But, personally, I think all us guys were sweet when we started our journey. 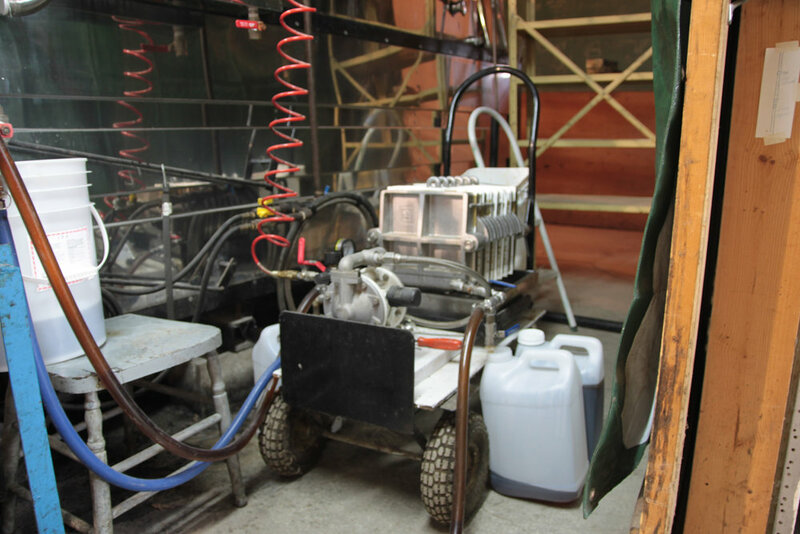 We are no longer raw sap, we are called ‘Concentrate” and we wait in yet another holding tank. The next step is really exciting for us! We are waiting in the stainless steel tank, ready to be gravity fed into the evaporator (big shiny machine). Things really heat up here! Who doesn’t love a campfire? This is what is happening underneath us. 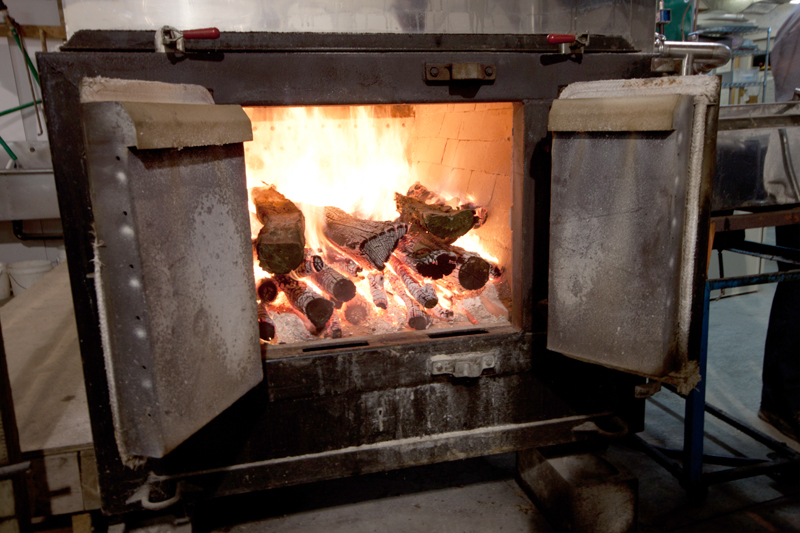 Mr. Hoover has a forced air wood fired evaporator. Here we are, bubbling with excitement in the syrup pans. We are losing even more water as steam. It is hot in here, but we love it! This is the most important piece of equipment Mr. Hoover owns. Every 8 minutes, he puts a wheel barrel load of wood into the fire. It is very important to keep an even heat on the pans at all times! We like this! 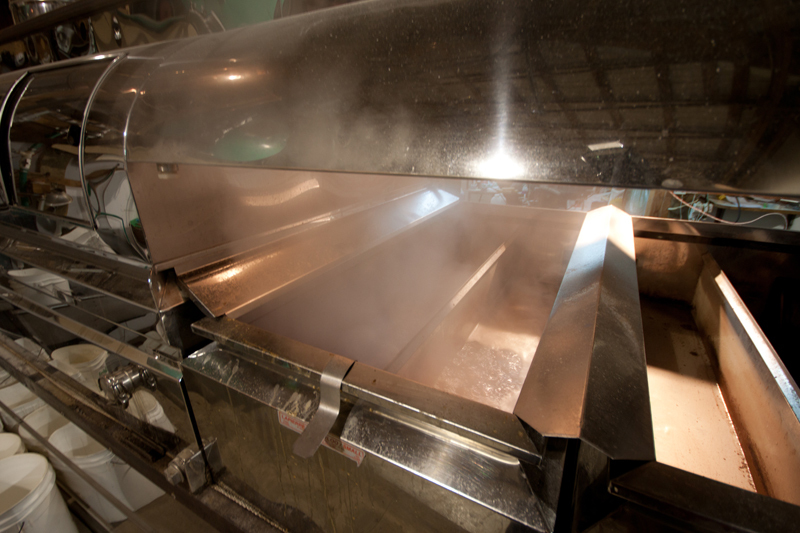 Weeeee… here we are leaving the evaporator and going into the finishing pan. 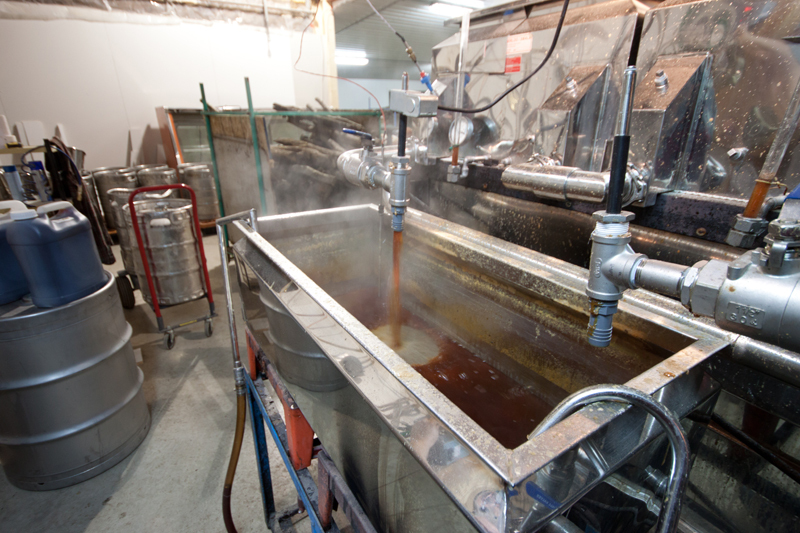 We are no longer concentrate, we are now 100% certified organic Maple Syrup! After a quick cleaning, we are ready to head over to the packager. This is the filter press that gives us our final cleaning. Here we are kept above 180 degrees F. for packaging into individual containers. Hot packing syrup is a best practice. It is one of the final steps that delivers you a quality product. Mr. Hoover needs to assign a 'grade' and Brix reading before we can be packaged, either in bulk stainless steel drums or retail sizes. Look at all the samples! Doesn't it look kind of like a scientific laboratory? Mr. Hoover keeps a sample of each batch. I kind of hope I am in the vial that Mr. Hoover keeps so that I can stay with him. I've grown attached to him. Ta Da – we are ready for you to take us home to enjoy! We really enjoy the work we do and how we work with Mr. Hoover to provide to you, a quality product. We are also thrilled that we can provide a great addition to any meal. We can enhance a meatloaf, ham, anything you can think of. Mr. Hoover says, “Maple Syrup goes great on anything except the floor”. We also learned through research and hearing Mr. Hoover talk to people that we provide a healthy alternative to sugar. We also have heard that we have as many anti-oxidants, if not more, than blueberries. Imagine me and my sappy friends being that good! It has been a pleasure sharing my journey with you. Hope you come and enjoy the fruits of me and my buddies’ labour… oh, and Mr. Hoover’s efforts too.